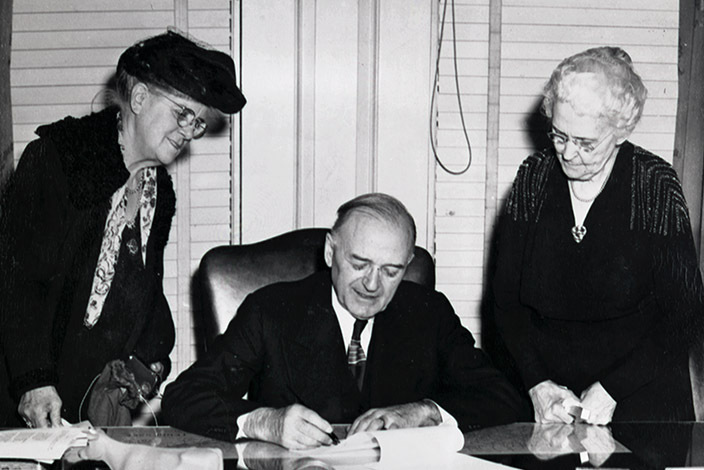 Graeme McGregor Smith, Governor McCord and Mary Daniel Moore at the signing of the bill to build the new Library and Archives, 1947. After the close of World War I, Americans refocused their patriotic efforts from selling Liberty Bonds, donating blood, and working at munitions plants to memorializing the United States’ role in the conflict. Graeme McGregor Smith, mother of two World War I veterans, was one of these inspired Americans who went to extraordinary lengths to ensure that every Tennessean who served in the Great War would be remembered. Her efforts resulted in the Record of Ex-Soldiers in World War I, Tennessee Counties, 1917-1919, the compiled service records of over 130,000 soldiers and sailors from Tennessee who served in the First World War. Service record information includes age, place of birth, residence, enlistment and discharge dates, and unit in which the soldier served. The records are arranged by county and divided into eight categories: Ex-Servicemen; Wounded; Dead; Officers; Marines; Navy; Naval Officers; and Dishonorable Discharges. Additionally, some counties include a Nurses category. These records are extensive, but they cannot be considered a complete list of all Tennesseans who served in World War I, since Tennesseans who enlisted in other states, those who died in military camps, and career military men are often not included. The records in this collection have been processed using text recognition software; however, full text searches of this collection may not be successful due to inconsistencies in type. An alphabetical index of servicemen in this collection, arranged by county, can be found here: http://sos.tn.gov/products/tsla/tennessee-world-war-i-veterans-introduction .